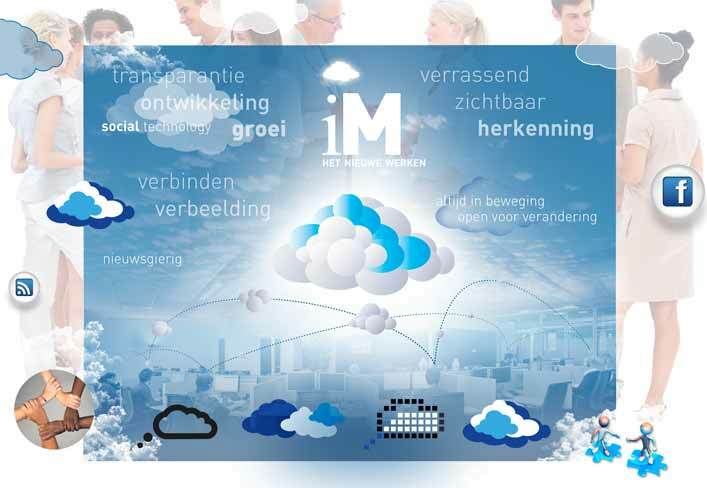 The joint IT department of Holland's largest supermarket concern Albert Heijn, pharmacy Etos and liquor store Gall&Gall needed an image upgrade and changed their name to iM (Information Management). The department only became visible when major changes were implemented (f.e. cutbacks or job losses), while the many positive developments remained unnoticed due to a lack of interest in the internal digital newsletter. A concept was developed with a new logo and and transition visuals, plus new ways to improve the internal communication. The concept is based on a cloud; a symbol of inspiration, representative for a (developing) idea or as a cluster of several ideas, thoughts and/or wishes. Dynamic - as it's shape constantly changes, on the move without bounderies, clear and transparent, both visible as invisible, and always developing; growing or shrinking, covering lots or only locally. A cloud functions as "brand visual", as point of recognition for every statement of iM. Because if it's growing popularity I searched for an association with social media icons, causing an almost natural curiosity. 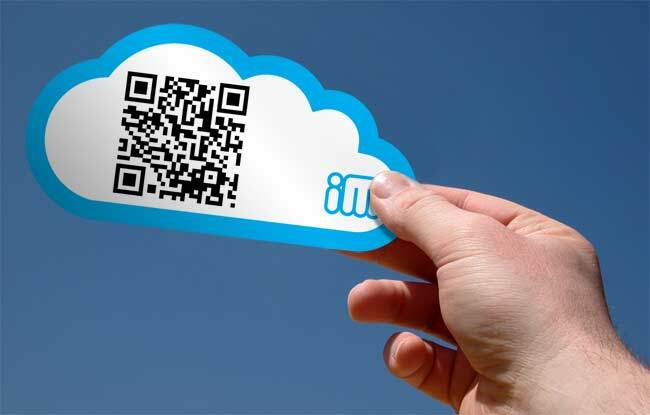 Refering to an emoticon, the "i" represents the person within the organisation, while the "M" -due to its shape- relates to the cloud as brand visual. Through various elaborations, the logo is widely applicable in a variety of expressions. Due of the simplicity its recognisability is maintained, regardless which of the three core iM-bases it represents: Operations - Change or Strategy. ...or even when implemented in (playful) variants, focussed on just one sector within the group. As iM (the place where new initiatives emerge) aims to share their initiatives, ideas and announcements faster in order to stimulate feedback at an earlier stage, we searched for ways to enhance internal communication. The current newsletter is supplemented by a number of communication methods aimed to arouse curiosity and stimulate participation through an interactive aspect. 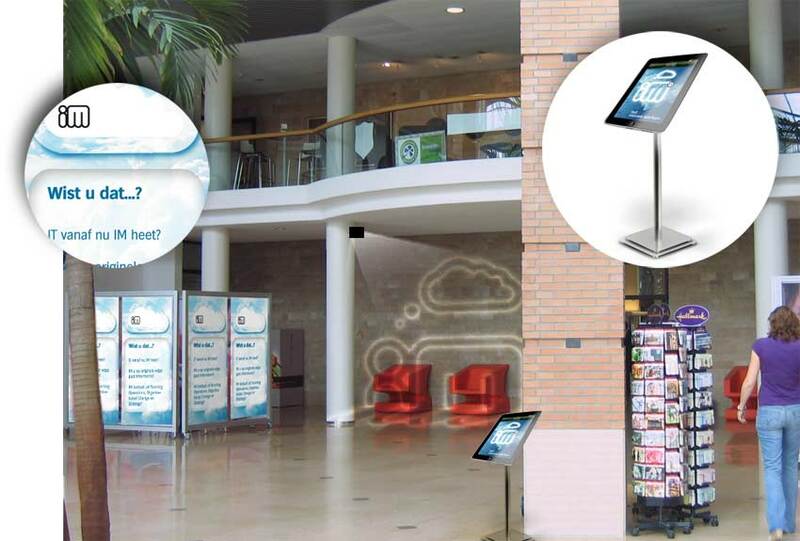 IM's messages will "pop-up" through different methods on a irregular basis at varying locations throughout the building. 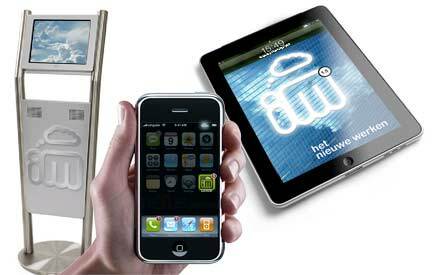 Via light projections, signs or digital pillars, or oldskool memos on pop-up boards. On unexpected locations quotes, soundbites or short animations can be found and QR codes can be scanned to get detailed information about a particular initiative or idea displayed. Witb the iM app employees are able to instantly give feedback and iM will become more visible within the company structure. The uniting factor through all these methods of communication from iM is the recognisable symbol of a cloud. Ultimate goal is that employees will be naturally attracted to the cloud symbol when and wherever it appears, eager to know what is brewing inside the think tank.